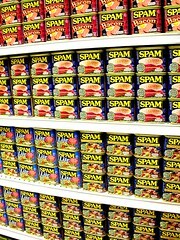 I am losing heart with the battle with spam. Incredibly, almost 90% of internet traffic is composed of spam with the number expected to hit 99% in the next few years. Efforts by AOL and Yahoo to charge for e-mail delivery begins to look like the more attractive option. Posted bydjpappas July 5, 2007 Posted inTechnologyTags: email, NYTimes, spam, Yahoo! Inc.